If you are looking for the perfect addition to your outdoor patio or deck, look no further than a planter with trellis combination! Lots of people already have plants growing in these areas, so why not use the addition of a planter to watch your beautiful flowers and vines as well as vegetables grow up as well as than out? Not every kind of plant is suited to climb a trellis. A plant must be classified as a climbing plant in order to wrap or adhere itself to this means of support. Some plants, such as grapes, purple passionflower, and sweet peas, are tendril climbers. The main stem of the plant develops small tendrils which grab hold of the support when they touches it. This is how they anchor themselves to the trellis. Twining climbing plants, such morning glory, moonflower, black eyed Susan vines, clematis, climbing nasturtium, and honeysuckle, have either leaves or stems that twine around a support such as a trellis. Using their leaves like the tendrils, they twist around the trellis – or anything else in their way that they deem suitable as a support, as soon as they touch it. These plants would really stand out when growing on a trellis. Clematis especially comes in many beautiful colors. Plants classified as scramblers cannot climb by themselves. Occasionally, they will have thorns that can help them to get a grip on a support. To use scramblers, such as climbing roses and bougainvillea with your trellis, you will need to give them a little help. The usual method is to use wire or strong string to tie them onto the trellis where you want them to grow. There are many varieties of climbing roses, most notably the Joseph's Coat, which can have orange, pink, yellow, and red flowers on its vines all at the same time. You would love the way a Joseph's Coat nestled in a planter would grow on a trellis and adorn your patio or deck. Some plants have actual adhesive pads! Boston ivy and Virginia creeper are two of these. They produce tendrils on their stems that contain these pads, which will stick to just about any surface there is. Another classification of climbing plants uses their own stem roots to cling to a trellis. Notable among these are climbing hydrangea and English ivy, both of which would look stunning on a planter with trellis combination. Tomatoes can do quite well when grown in a planter on your patio. It will be easier for you to raise healthy tomatoes by having the vines off of the ground and on a trellis. Pests and insects are more easily controlled, and since the plants are close to your home, you just might end up giving them more attention. If you already have an assortment of good sized planters in your outdoor areas, you don't have to toss them to make way for new ones. 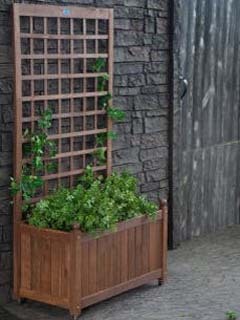 You can buy trellises separately to add to your existing planters. Or, if you decide the time has come to invest in new planters, you will find a host of planter with trellis combinations both online and at your local home and garden center. You can find trellises and matching planters made from wood, plastic, and metal, and in various shapes and sizes. You will have a lot of choices, so it's best to know what the differences are. Plastic is generally one of the the most affordable types of material for this combination, but keep in mind that the thinner, cheapest plastic can crack and break easily when it has been out in the weather, or when the plants grow too big for both the planter and the trellis. You can find both of these made of a thicker plastic that can be quite durable. PVC vinyl trellis are also long-lasting. Wood can also be an affordable option, but these are generally not treated to resist the weather, and will rot over a period of time. Metal trellises are also available, and a lightweight aluminum trellis would go well with any type of planter you may already own. Do some research on the type of climbing plant that you intend to nurture. If the vine is going to end up being a large and potentially heavy one, make sure you choose a trellis that can stand up to its size and weight. Also, make sure that you secure your trellis well in order to support the weight of any plants it will hold. Often, the soil in the planter is enough to do this, but keep an eye on your plants just in case. With just a little thought and care, your planter with trellis can be the focal point of your patio or deck.